A man raised as a Protestant Congregationalist is repelled by what he considers his religion's bigotry, narrowness, superstition, and revivalism. He breaks away to find the truth in religion, and finds it in the Roman Catholic Church. However, after joining that Church, and subsequently writing about his journey of faith, he meets with unfair criticism and denial. 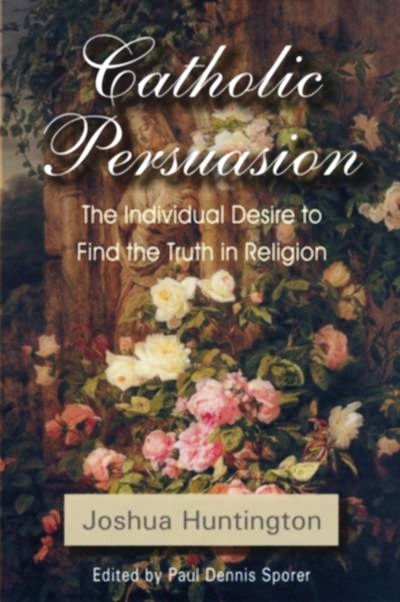 Catholic Persuasion, by Joshua Huntington, is an outstanding record forgotten account of the inner workings of conversion. His work promises to shed "light in many dark places" in the hearts of those who are struggling with their faith, and are having doubts and questions concerning the nature of religion. It is indeed an outstanding record of someone who was a Protestant going over to the "enemy", that is, the Roman Catholic Church. Huntington's book could be said to describe the interior history of a mind traveling from Puritanism to the Catholic Church over a long and circuitous route. Despite this intensely personal revelation, Huntington is always sincere and earnest in his disposition, and therefore a competent witness regarding those things which he observed. In excellent detail, Huntington in his book gives the reasons why he began to question his faith, and why he thought that the Catholic Church was superior. Ultimately, Huntington believes Protestant churches have failed to give people guidance, and this has produced a general intuition that perhaps there is no positive religion revealed by God, but that, if there is one, it is the religion taught by the Catholic Church. This intuition should not be denied, but should be faced directly, as the questions addressed by Huntington do not constitute only an individual viewpoint, but are representative of a large class of people, completely disappointed by Protestant theology, and yearning for a satisfactory doctrine. Catholic Persuasion allows us to witness a process of spiritual growth and liberation, achieved by courageously confronting some of the most difficult issues that face both Protestantism and Catholicism.